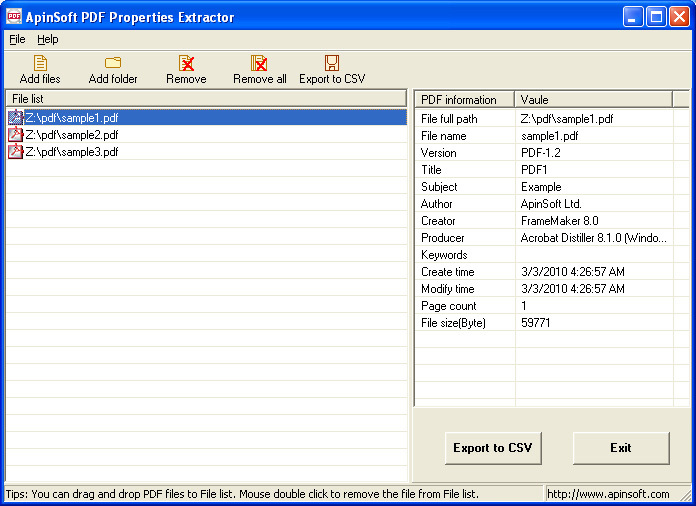 ApinSoft PDF Properties Extractor is an application that will help you to view PDF document properties and export all the PDF files properties to a CSV format file. File full path, File name, Version, Title, Subject, Author, Creator, Producer, Keywords, Create time, Modify time, Page count, File size(Byte). You can export all the selected pdf file properties infomation to a CSV format file. The CSV format file can be open by EXCEL or other applications. ApinSoft PDF Properties Extractor does not require any other applications installed in your computer. Copyright ©2007-2017 ApinSoft Ltd. All right reserved.